An extract from the book "Atom and Octave" by Maryel Gardyne. It is the electron microscope and all the apparatus invented since its discovery that have revolutionised our view of the world and brought us into contact with regions of experience, belonging formerly only to men of faith. As we search ever deeper into the sub-atomic depths of matter and observe the passing tracks of fleeting entities, the bursts and showers and spirals of the spectra, we can glimpse many phenomena in dimensions even further back. The structure of this same matter dissolves into more and more nebulous and mathematically imaginary formulae - many expressions of which we scarcely have time to register before they are gone from us. These entities, appearing, passing and disappearing almost instantaneously, suggest new ways of evaluating their activities. As we peer in, we seem to meet energy bursting out from a mysterious world behind and beyond our own. There seems no clear-cut boundary between what we call the physical world - "what is” - and the non-physical or - "what is not". What is not, in fact, simply exists on a higher level of frequency or octave, which we cannot touch, see, hear or smell with our physical senses, because its higher level of frequency is cut off from ours by spiral action. The microscope has simply extended our range of vision into areas formerly closed to us - but which was always there, beyond our sensory knowledge. (see Fig.5 Ch.2) The table of frequencies and their wavelengths, called the spectrum, found in every physics textbook, represents the whole range of frequency known to us at present. Among all these, our own atoms vibrate in the waveband of light, which is a tiny fraction of the whole range. But, as we see from harmonics, it is not separated from all the others - but partially cut off from them by their spiral action and the constraints of the Mathematics resonance factors. Although the different bands are usually called levels or cycles, they can just as easily be called octaves and, by their numbers, we can find out how many octaves there are. I am not aware if anyone has yet done this set of calculations in an octave context. What is so odd is that, in science, we now seem to know so much more about the spectrum and its infinite ranges of cosmic rays and other spectra at up to 1022 kilohertz in frequency, and 10-17 in wavelengths. Sub-atomic particle research compels us to return to a consideration of them. Now, with the aid of the comma and the spiral action of vibration, we can understand how everything fits in. This question of levels was discussed by Lord Dowding who was Supreme Commander of the Royal Air Force and who masterminded the Battle of Britain in 1940. In his book “Many Mansions”, he has tried to show, in a simplified way, how the different levels interlock in both cosmic and human terms. Dowding says: "I want you to think of the Earth as the centre of a series of hollow spheres, each one bigger than the last. The first corresponds almost exactly to the earth's surface in location though not in substance and the number of spheres in outward order is infinite, so far as our knowledge goes. Each sphere represents a different state of development a little in advance of the one before and ... progress is outward and upward and onward .... once the restrictions of the earth have been left behind ... Now don't think of these spheres in too materialistic a way; they are real and solid enough ... but they are quite invisible to us and cannot be perceived by any of our senses.” He continues: "This is a hard saying, because we can see the sun and, beyond it, the stars and we say that there can be nothing between us and them. But, in that, we are wrong ...” and this can be confirmed in that there are layers at various heights above the earth which reflect wireless waves ... it was through research into these that radar was discovered. Danielou notes the 21 Circles "which separate us from the metaphysical Sun", the central Eye, "that sees everything". These Circles, he says, "we shall have to cross before being reabsorbed into all knowledge.” (It is probable that Danielou became a Buddhist, which may explain his terminology.) And the "central Eye” evokes in our minds the God of Genesis who "saw everything that He had made” - "and saw that it was very good”. The world that He had created was perfect. It was meant to function. Danielou equates these 21 circles with the 22 (21) notes of the Hindu octave which also echoes the 22:7 ratio of the diameter of a circle to its circumference which, Danielou makes clear, are both aspects of octave theory. Fifty years ago, Dowding notes, chemists thought the atom was a solid, hard substance. But we now know it to be a tiny solar system of particles of positive and negative electricity "in ceaseless motion - and, when you ask them what electricity is, they cannot tell you.” This is written in 1945. "So our matter,” he continues, "for all it looks so solid, is nothing but ..countless billions of electrical particles in ceaseless and violent agitation in tiny orbits. It looks solid because it obstructs the passage of that particular band of etheric waves which effect our optic nerves and which we call light. And it feels solid because the bouncing particles of matter repel the bouncing particles in our hands and in the soles of our feet. If our optic nerves had been constructed to react to X-ray wave-lengths and not to what we call light, we should be able to see through matter suitably illuminated - but we could not see the sun. And, if our bodies had been built up of particles having X-ray wave-length, we could pass through matter because the bouncing particles of matter would not resist those of our new and different bodies ... “ But we are not made of X-ray wave-lengths - so we cannot visualise the finer elements at faster frequencies. It is well known, however, that many animals do indeed have totally different faculties from ours, which enables them to operate in media suitable for them - but not for us. It may be rather humbling for us, having built up a picture of ourselves as superior beings, to have to admit that many species are far better adapted than we are and that they can survive in circumstances and conditions too harsh for us. Every species reacts to environmental stimuli in different ways, appropriate for their lifestyle. Human eyes react to wavebands that allow us to perceive the impressions we need for performing our human activities in daylight. The bee sees ultra-violet light so that it can find its way, even when the sun is not shining. The owl and the bat can see in what is darkness to us - but what is as “daylight” to them. They are blinded in our daylight. All creatures are adapted to pick up the signals from their surroundings that are important to them for their particular lifestyle. Unnecessary signals are blotted out. In a “Horizon” television programme, on 6th January 1978, called “Living Machines”, it was stated that "for fruit-flies flying through the air, it will be like swimming in a viscous liquid. That is what atoms in the air must look like to them. We (humans) are not aware of the atoms' existence ... To single-celled creatures like Paramecium, it must be like a treacle through which they swim.” (I do not know how scientists can make such a deduction - not being Paramecium themselves! The assumption must be that their faculties are similar to ours. But fruit-flies do not look as if they are swimming and, surely, if they were, they would appear to do so.) However, the inference has some substance, for it is trying to show (which it does not) that there are different ranges of biological organisation and different reactions to stimuli within the vast hierarchies of energies, and according to allotted roles. The elephant looks to be more deeply embedded in matter than, say, the hummingbird or the dragonfly. The latter are barely with us - a flash, a whirr, airborne, and not much else - they can perform in a much rarer medium where we cannot emulate them. Human and elephant feet must keep contact with the ground. The almost weightlessness of a tiny bird, held in the hand, may imply some quite other elements inter-mingled in its makeup from those we know in chemistry - even though some of those are also present. The elephant's atoms may be of a much denser composition by comparison. The difference, if it is there, is not apparent to the chemist. There are infinite ranges of frequency over many octaves, all resonating to a certain degree with those near to above and below them. Nothing exists in only one octave. All impinge upon one another. The "circles” of the philosophers obviously refer to those octave levels which are common to all religious literature and which are the basis of all alchemical theories. It has really only been in recent times, within the past 200 years, that the knowledge of them has been discounted - and virtually discarded. One of the best-known exponents of “models of Creation”- explained by the structure of the Universe- among English alchemists was Robert Fludd, in the seventeenth century. He described, with the help of a number of very meticulous drawings and diagrams, his detailed visions in dreams of the structure of the universe. Among many aspects of cosmic theory explained, he postulated what he named the "Ptolemaic Universe I, II and III”, in which he described 22 various circles in groups of 3. Fludd's work is summarised by Jocelyn Godwin in a Thames & Hudson publication simply called "Robert Fludd". Although only an outline of a life's work, the book contains a wealth of data, reflecting the way Fludd saw the cosmos. The 22 circles of the first universe start at the centre, with the Earth as number 22, surrounded by, in order: Water - 21; air - 20; fire - 19. Next comes Luna - 18, the moon; then all the planets to Saturn - 17 to 12; next the Caelum stellatum - presumably, the constellations or heavenly bodies, the stars - 11; then Angeli - 10; Archangeli - 9; Virtutes (Virtues) - 8; Principalities - 7; Potestates (Powers) - 6; Thrones - 5; Denominations - 4; Cherubim - 3; Seraphim - 2; and finally Mens -1, which Fludd calls the Cosmic or World Mind. This is Ptolemaic Universe I. From "the infinite Light of God, a Spirit descends to the uttermost depths of matter". The Infinite or Absolute creates, by limiting its own infinity” ... by a process with many names - Simplex, Starting Point, Source of Essence, Being of Beings, Nature producing Nature, etc. The Cosmic mind is "open, on the one hand to the Absolute” and, on the other, entering the constricting vortex that is Creation. (Matter.) Studying Fludd's diagram, we see that each element in the 22 circles is placed spirally from the centre, making two complete revolutions, as in Kayser's Tone Spiral. (I call them elements, for want of a better term.) Kayser's Tone Spiral complements this view (see Fig.2 Ch.2). Whether circle, spiral or whatever, however, both are expressions of one principle, the octave of sevenfold development. We tend to view our "energetic” world in too few dimensions, partly because we depict our ideas about it on a flat surface - on paper, by which means we try to visualise what are, in fact, activities in volume and in space/time. Kayser's diagram of harmonics, radiating out from a centre, looks like a half-open fan. In reality, they spread out in all directions like a dandelion puff, with spiral tendencies which are also four-dimensional. It is an endless sequence of spirals whirling around in enormously different degrees of magnitude, from the almost invisibly minute, to the swirling galaxies, and spirals within greater spirals like the waves on the swell and the swell on the ocean. At the same time, all "levels” of octaves interpenetrate each other everywhere. Ptolemaic Universe II was a vision of "instant creation” but there are still three divisions and the terrestrial globe appears, as if at the dawn of existence. Adam and Eve are visible in the Garden of Eden, and are already conversing with the Serpent. (UCH, 1.a, p.9.) The Serpent, presumably, was not a good influence. Fludd's Ptolemaic Universe I and II compare with Stirling's figure of the Cosmos (“The Canon”, p.28). Stirling's figure is also divided into three main divisions - i.e. the three circles of the Empyreum, then the sphere of the fixed stars and the seven planets and, thirdly, the sublunary or elemental world (whose detailed content he does not specify). But the Ptolemaic Universe I is also divided into three - from 2 to 10, the nine orders of angelic beings; 11 to 18, the fixed stars and planets; and 19 to 22 the sublimary or material sphere of matter, fire, air, water, earth. The second Ptolemaic universe has the same grouping into three as the others. Ptolemaic Universe III is "the mirror of the whole of Nature and Image of Art". Besides repeating the "levels” of the others, it shows the levels of animal, vegetable and mineral life in various categories. Fludd suggests that Nature has a "helper” who, imitating her, produces things similar to hers. We call it Art. Fludd categorises the Arts as: - 1: “The Liberal Arts” - those practised by Man and known to us as Culture; 2: "Art supplanting Nature” - the use we make of natural processes, such as keeping bees for honey (apiculture), silkworms, medicine (the use of herbs etc), egg production or milking cows. (My additions.) 3: “Art assisting Nature” - the cultivation of vegetables, fruit, tree-grafting and other methods of growing food in ways that Nature does not do herself. 4: “Art correcting Nature” - the use of distillation, to change a product into something we prefer, and with keeping ability (jam or wine making etc); and processes undertaken by "alembic and retort” which must mean alchemy. Fludd goes on at great length into the structure of the universe and natural things in a manner far too long to summarise. He sees things as spiral, cyclic and musical and gives many examples of the ratios involved. He is in no doubt as to the importance of music in the scheme, and of the octave nature of the levels. The whole idea of octaves of very high frequency numbers, emanating from the Absolute down to the slower frequencies of the Sentient World, can only be satisfactorily grasped by our twentieth-century minds when we remember the cycle of fifths through which it can be rationally explained. The Pythagorean Tetrad (Godwin, p.31) is "another model of Creation” in Pythagorean number philosophy handed down in Plato's Timaeus. "The Monad generates the Dyad; and the Triad and the Tetrad follow, the arithmetical progression continuing indefinitely” as in the spiral of fifths and at the same time as harmonics, radiating outwards. In Fludd's pictures (Godwin, p.24. nos. 5-10) the complete darkness precedes the Monad, the first created Light, the Dyad is the Polarity of Light and darkness with which the "Humid Spirit” makes a third. The polarisation of the four elements concludes the Foundation of the World, bringing the number of "principles” to 10. Fludd borrowed this mathematical philosophy from Francesco Giorgio, whose “De Harmonia Mundi” (1525) also supplied him with his ideas of the musical proportions as a universal schema. Fludd's diagram of the Pyramid of form and matter leads directly through proportion to the Music of the Spheres, followed by the Divine Monochord. He gives all the string-lengths, which agree with Stirling's architectural measures. The final figures are the Monochord with its cosmic octave notation and the Nox Microcosmica - the "Diapason Closing Full in Man". (Godwin, p.45 - 47.) The early Christian writer Origen also, according to Stirling, in his book of “Refutation Against Celsus” (Book IV, Chapt. 23), describes "the cosmic ladder of the Mithraic mysteries” - but there is not sufficient data to pursue these references. Mithraism was an early Christian/Roman "heresy” that was eventually ousted. One of its "temples” still survives in the catacombs below the Church of St Clemente in Rome. This church is now famous for the greatest of the wall paintings of Massaccio and many beautiful mosaics. But, if we descend to a level below the crypt, where water courses flow that connect with the sewers of Rome, we find a chamber with the Mithraic altar still in place. We have not, for a very long time, known much about them. They are being researched again today. Mithraism also, Stirling suggests, held the belief that "there was a harmonic arrangement of the Stars". And opinion is now changing about them. On Man's Constitution, Godwin (“Robert Fludd”, p.37) affirms that "everything begins in the darkness of potentiality and emerges into Light” - which sounds like gestation and birth. Motion begins, from the nothingness of potentiality, to the act of generation and the origin of life". The circles of this diagram show the archetypes as expressed by the Hebrew letters. Yod is Absolute Father, shrouded in darkness (to us) which manifests through the Sun and Spirit. For each step in the Caballa - Aleph, Yod, Mem, Shin, Vau - is assigned a certain element of substance in Creation, right down to matter. The impression is given of a tapestry of interweaving principles (or powers?) like the stitches of a pattern, which eventually reduce to the manifested world. To round off Fludd's cosmic constructions, we find the Trinity and Generation of the four elements in a section on sacred numbers. Fludd states that "Unity is the Starting Point” - the Absolute, presumably. "Duality is the first born, the mean between Unity and Trinity. From the Dyad (Dual) proceeds the Third (from the Octave, the fifth), the Holy Spirit which is one in essence with the Father and the Son, and, in turn, binds them together. (We could also call it (them) positive, negative and neutral.) Everywhere we find Triads expressed in terms of principles. But they are also God, the Father, Son and Spirit of the Christians - for Fludd was a Christian. In Chapter 2, on the Caballa, Godwin gives an interesting interpretation of the meaning of the Hebrew Tetragrammaton which, initially, recalls the Tetragrammaton of the Microcosm. (The Greek one is different). "Hermes says that the world is an image of God, and Moses (also says) that Man, too, is made after God's example.” (Note - example, which is not quite the same as image. Likeness, which is often used and interpreted as image, could also mean resembling but not exactly the same.) The message could really be interpreted thus: "Do not strive to be an imitation of Me, which you could never be, but try to do as I do.” To be like me, and that is, one would think, obey God's commands or some such meaning - to follow His directives and to love your neighbour. All Caballists refer to lower realms and archetypal ones. And, beyond all, is the letter Yod from which all proceeds and which conceals within itself the whole Name. It is too long and complex to quote. The Psalmist says that God places His Tabernacle in the Sun, and this we may interpret as follows: God forms, around the Sun, the ethereal world (Vau), dividing the Empyreum from the lower (He). "He divided the Waters from the Waters with the firmament between them ... and the firmament He called Heaven.” The puzzlement caused today by this description in Genesis, as to its position in relation to the Waters, can be partly relieved by Glazewski and Danielou. Glazewski notes how Michael Watson found the space between atoms to be filled with "the fourth state of Water” and that it is like the ether, which is everywhere. The firmament is a different state of water - not as H2O. It will be discussed again, later on in this Chapter. In octave levels, one "state” is divided from another by vibratory laws, as in the spiral of fifths. Lord Dowding notes, in “Many Mansions”, the series of cosmic spheres, "like the skins of an onion,” surrounding the earth - but, in fact, they interpenetrate with it. The electron microscope has opened up for us a part - albeit, as yet, a small part - of this vibratory ocean of experience in which we dwell. It offers us a close-space, clearer view of what goes on and, without spectroscopy revealing the pre-physical world of pattern and order behind the phenomena, we could all too easily remain stuck in materialism and unbelief - and to continue to call all extrasensory experience "superstition". Today, we can witness the spiralling tracks in bubble-chambers and the pre-physical activity and the ordered patterns of spectra. Through spectroscopy, our whole conception of the material world as a conglomeration of chemical reactions only - somehow managing to shake themselves into ordered forms of chickens and tulips, potatoes and seagulls, black faces or yellow, greentailed peacocks or blue, oaks or hawthorn or seaweed - becomes the absurdity that it is. It could never repeat an experiment, never organise forms. The scientists who still advocate it can no longer sustain this argument. The world is moving on. Today science is, in fact, being inexorably moved in the direction of the philosophers. An article in “Scientific American” of July 1980, and called "Fifty to One Hundred Years Ago", seeks to define the meaning of "levels", even within matter. "It is curious that, while from the unscientific view, the unpardonable fault of modern science is its materialistic tendency, the actual drift of scientific thought is (in fact) towards eliminating from (its) ideas on matter everything that answers to the popular notion of it ...” Scientists are now seeking beyond materialism to the realms of the non-physical and are now ready to admit their existence. Professor Crookes claims to have demonstrated an ultra-gaseous state of matter, as unlike the other three recognised states of matter as they are unlike one another. The fourth state obtains when the gas has been so rarefied that the collisions of molecules are few compared with the misses. "If we follow in our imagination the free molecules of flight they lose all known properties of matter and become as if they did not exist. For what is one single gas molecule in space? Is it a solid, a liquid or a gas? Solid it cannot be because the idea of solidity involves certain properties absent in the isolated molecule. And if the individual is not solid, a fortiori, it cannot be a liquid or a gas ... What we call matter is nothing more than the effect on our senses of the movements of the molecules. From this point of view, matter is but a mode of motion.” The motion is vibration and its effects on any other vibration vary according to frequency, the different octave levels and resonance phenomena. All the lower levels of manifestation exist, according to Glazewski, surrounded by what he calls "L” and "T” fields, which letters he designates to what he calls "primary fields". L fields for Life and T fields for Thought. He has discussed the problem of the transmission of thoughts and also feels that it would be impossible for atoms to adhere together to form molecules - in, say, a finger - unless there were some "organising field” behind or before the atoms that could hold them to their form. "This organising field” he says, "is being studied intensively in many universities, though little has been said about it yet.” This was written in the 1940s. Thought produces radiation, he says, as matter also does. "This radiation is the function of biological metabolism and carries with it, as any radiation does, the whole information about any biological changes. These changes are, in turn, the result of emotions and (in humans) thoughts.” The conclusion is that signals are emitted that describe these changes and can affect the thoughts in their turn, a chicken-and-egg situation. The problem lies in our ability or otherwise to interpret specific warning signals - which there always are, but time and again we do not hear them. 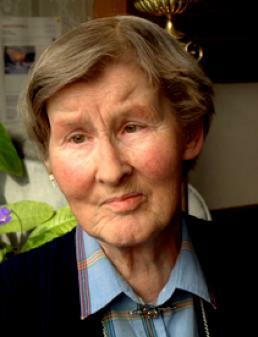 The L field was investigated by Professor Burr at Yale University and his published work on it, “Blueprint for Immortality”, is now well known. Behind the L and T fields, says Glazewski, must lie, even further back, an "organising field” which may be the "soul” of the Christians. Whether behind or before, it must be on a higher octave and therefore it controls the L and T fields, as the higher always controls the lower. It is also perhaps comparable to the archetypes of Jung. T C Lethbridge in his researches with the pendulum also speaks of L and T fields. I do not know if he had ever met or had heard of Father Andrew. If we think of all those different layers or octaves that impinge one upon the other through resonance, a great many tenets of ancient faiths can be better understood. Thus, there are said to be "five states of water” (Glazewski), researched by the English scientist Michael Watson and described by D Milner and E Smart in “The Loom of Creation” (1975). "Water is ice as solid, gas as vapour and water as liquid” and then there are two other states of water at least, if not more, which are invisible to ourselves. Watson discovered that what he called "the vast atomic void” - the spaces between the atoms - as being filled with the fourth state of water which follows on the state of vapour (steam). It is believed to be the Hindu Prana and the Jewish traditional Avir. The ancient Chinese also had similar ideas about water. Watson found the fifth state of water to be pure radiation - a sort of "shining-ness". The fourth state responds to thought. The fifth "manipulates” the fourth and "all sorts of implications follow". Incomprehensible references to water in the New Testament fall into place - for example, why water is used in baptism or the "water of life", Christ spoke of to the Samaritan woman ... "Astronomical space” is filled with the fourth state and, when its balance, is upset by thought it becomes agitated and converted into vapour; then into water as we know it, "and the Biblical Deluge can thus be understood” (Glazewski). In twentieth-century chemistry, elements are now held to be transmutable into other elements, as has been argued by Louis Kervran. So water may be transmuted into different degrees of substance, and we can observe this quite well from daily experience. Glazewski guessed that what Aristotle called "Materia Prima” is really just this fourth state; and this could account for the firmament of Genesis. The division of the waters is simply two different levels of frequency. Our bodies are also 80% to 90% water - without sufficient of which to sustain us, we quickly die. "It is strange,” Glazewski notes, "that it is just at the beginning of the Aquarian Age that these states of water should have been identified scientifically". This seems to confirm theology, thus Aquarius is the sign of Air and vibration. According to Glazewski, our thoughts can influence the L field and we can prove this, because we can, by thought, move, say, a finger. Thought can imprint the fourth state upon our bodies and produce effects, tensions, patterns of behaviour and transmit information this way; and resonance must be the key, the mechanism that carries it out. This accounts for the power of the mind over matter to a certain extent. And, further, inevitably, it can effect other bodies and other minds by the same resonance factor. It is the medium of mental energy and, even, of psychic exchange. He suggests that the fifth state corresponds to the concept of sanctifying Grace of the Christian theologians. This is "brought into being by the "potentia obedientalis” - obedience to God's power from the human essence. We know from the mystics that this power is encountered as brilliant white light. It is pure radiation, glimpsed by Watson as a "shiningness". "We might suppose", he concludes, "that there will be a sixth and seventh state of water - but we have no evidence of it yet". The states are all octaves in the same way as the L and T fields must be. We must feel (L field) before we act and think (T field) before we feel, in order to know what we feel. We do not know exactly how many octaves or fields there are yet. But, the higher controls the lower one. Try to act without thought - instantaneous though it may seem - and see what happens. You will probably fall flat on your nose! Plenty of other modern writers seem to be convinced of this octave structure of things. Arthur Young, who developed Bell's helicopters in the United States, worked out a schema of seven levels of seven groupings which he described in a book called “The Reflexive Universe”. Young recounts how, when trying to adapt an aircraft assembly-line for helicopter production, the engineers found they could not partially alter or adapt the arrangement of the assembly line which kept on returning to aircraft parts and "seemed to have a life of its own". This led him to research what he called "process” and tabulate the "resistance” shown by a particular set-up to any adaptation. Once programmed, it had to go on that way. Apart from what such a discovery might do to Darwin's theory of mutation of species into other species, Young was finally led to a deep study of molecular organisation and, eventually, to create a system of evaluation of different stages of organic development. Process tends to be what it is. It does not, of itself, become another process. By means of geometrical analysis of tetrahedrons and the relation of points, lines and planes, (see Gimbel) of these figures, the pentaverton (his name for a pentagon) and the heptaverton, or seven-pointed star, he suggested seven levels of manifestation. From simple molecules to more complex orders, from metals to salts and hydro-carbons, protein compounds, polymers and polypeptide chains, the double helix of DNA - seven stages(see Fig.24b, Ch.7); from these, on to living creatures, single-celled organisms, amoeba etc, to algae, plants, trees, insects, birds, fishes and small and large animals, another seven stages. He envisaged, also, first stages in the prephysical worlds, sub-atomic particles up to whole atoms. Finally, a seventh stage of seven stages of consciousness, including lesser animal and, then, human consciousness and that of unknown beings (which he equated with archangels and even higher beings). Process, he stated, begins in the cosmos, descends into matter, increasing in physical complexity to its lowest point. And then it ascends again, liberating itself from its physical limitations to return whence it came. The climax of this stage is reached, as far as our knowledge goes, in Man. After being human, we leave the earth and continue on into the next stage. While quoting Eddington, he makes us think of Plato and that we are all on the verge of a discovery. But many of his ideas are not central to my theme. The sub-shells, however, into which he divides the periodic table, are a new way of analysing its structure and worthy of consideration, especially in a Fibonacci context. A better-known exponent of a teaching based on octaves of experience, writing in the middle of the twentieth century, was P D Ouspensky who emigrated from Russia after the 1917 Revolution and wandered widely between Paris, New York and London. Having parted from the even better-known philosopher Gurdieff, he set up schools of his own. His three books - “Tertium Organum”, “A New Model of the Universe” and “In Search of the Miraculous” - are filled with "fragments of an unknown Teaching", the key to which he felt he had never found. Ouspensky lost most of his valuable library when he was forced out of Russia. So, few references are given. This makes the fragments he does present to us even more difficult to assess. However, the central theme of his work seems to be the Octave nature of the universe. A description of the Law of Octaves, made up of the Law of Three and the Law of Seven, which produce a spiral, 7-note path in the course of a vibration or wave. Each segment has a note and, at each end of Herbert Whone's "places of tightening", between Mi and Fa and between La and Si, the vibration changes direction, so that, at the end of its journey it has come back whence it began. This is very difficult to follow and we have no way of being sure if this is what is actually meant or only what he could remember from his lost sources. In the same way, Ouspensky's nomenclature and his numbers are his own, except for his tables of octaves which display equivalent 256 as the fundamental with 384 as the fifth in every level from 1 to 12288, as will be explained therewith. Equally, when he talks about atoms he calls them all hydrogens in different octaves, with carbons, oxygens and nitrogens appearing in triads which overlap and interlink with each other in a way he cannot really expain.. His octaves start at the highest point, of 1, and reduce in sequences of fifths to 8092 and 12288, 12 octaves down. To Ouspensky, 1 is the Absolute. From out of which or whom all else comes. 1 is at the top, the starting point. It becomes the note Do. Within it (like any other overtone series), the octave called the Ray of Creation exists, each level an interval with its own note and its own overtones in turn, making more notes etc. There are 12 triads arranged in such a way that they seem to be interlocked. They are all in the ratio of octave and fifth to each other. ... and so on to 12288. The difference each time is 1.5. All overlap in the same way, the series beginning from 6. Each row is given a name and a note also in each triad. They are Mi, Re and Do. The only thing that can be found to say about this series is that the numbers comprise octave and fifths ratios in every case and they are all our Hindu cosmic and musical numbers. There is another, even more complex table which, when studied closely, appears to suggest that all are octave levels with different frequency which represent different aspects of manifestation relating to the range of experience of man in physical life. There are numbers that represent food in the physical range and then less material sorts of food, or nourishment - such as sense impressions, air, emotions - and then, higher up the range, there are angels and archangels, the constellations, seraphim etc. Here we are on familiar ground and it will be easy to assume that Ouspensky is really describing some system familiar to us already from the Asian or Christian sources already quoted. One could speculate long. But it does seem that he is the first to spell out the octave numbers and nature of the levels of experience of our cosmos. Ouspensky could be speaking of Harmonics, however, when he writes: "The fundamental octaves are connected with subordinates or surrounding octaves in a definite way. Out of subordinate octaves of the first order, come those of the surrounding order, and so on ... (it) can be compared with the construction of a tree. From the straight basic trunk, there come out branches into more branches, becoming smaller and smaller and (which) are finally covered in leaves. The same process goes on in the construction of leaves, in the formation of veins, the serrations, etc.” We would call it subdivision into smaller and smaller intervals, ending up, perhaps, with the sixty divisions of the Chinese. He adds that: "Like everything in nature, the human body, which represents a certain whole, bears both within and without the same correlations”. According to the number of notes in an octave and its "intervals", the human body has nine basic measurements, expressed by the numbers of a definite measure. In individuals, of course, proportions differ considerably but (still) within certain definite limits (p.135, “In Search of the Miraculous”). These nine basic measurements, giving a full octave of the first order, by combining in a certain way, pass into .... subordinate octaves, etc.” (The figure is quite simple to draw and shows a harmonic development of each note which is unmistakable.) And, if we ask "why 9 and not 7? ", we need to remember that the Chinese count 9 notes - as are also found in certain other circumstances elsewhere. Note that the Enneagram has nine points. "In this way,” he continues, “ it is possible to obtain the measurements of any member of any part of the body as they are all in a definite relationship to each other.” This reads extraordinarily like the octave arrangements described by Danielou when discussing Hindu divisions of the octave (53) where intervals are divided into first, second and third "orders” in which the intervals become smaller every time a new order appears. It can only really be understood if it is thought of in terms of harmonics, the "reverberations and echoes of the sound” activated at the beginning. They are harmonic progressions and the human body is constructed in the same way. Harmonic progressions rule in every sphere of activity, as is confirmed by Kayser's analysis of the harmonic principle discovered, through earthquake research, in the geological strata of the earth. Kayser writes: "One of the most characteristic phenomena in geology is the layer-like structure of the inside of the earth. The body of the earth does not consist of a thin skin and the rest a fluid mass, as was formerly supposed, but is organised according to its substances, into distinct levels, quite sharply divided from one another ... different zones were discovered in the earth's inner strata, where waves were effected in different ways. If one compares the radii of these zones with the string-length measurements of the overtone series of the primary major chord which is also a physical phenomenon, then we obtain a triadic structure of the earth's inside, in which the measurements of different layers show a remarkable agreement with the chord numbers. In this way, the firm crust of the earth falls into the seventh octave (the work of Creation) and becomes understandable morphologically as the "condensation” of the rhythms proceeding from that point - the Earth, one mighty chord!” (“Akroasis”, p.56.) We are finding similar structures exhibited everywhere. And, from there, a return to the Absolute - another Do. This is a cyclic action. (Ouspensky, pp.167-169.) The two "shocks” or intervals between Si - La and Fa - Mi (Whone's “places of tightening”) are the points where the spiral changes direction and while the upper one is not specified as to its content, the lower one (Fa - Mi) is called "Organic Life on Earth". Without Organic Life, Ouspensky asserts, there could be "no food for the Moon” - a meaningless concept to us. Presumably, vegetation processes energy and releases substances (like oxygen) through transmutation into finer elements that chemistry does not yet know of, that in some sense, the moon does use. We have to remind ourselves of all the frequencies we as yet know not of, that can be operating in ways undetectable. Is it possible that there could be life-forms on the moon or on the other planets, that we cannot observe and do not know exist? Man's existence, says Ouspensky, vibrates in the harmonics and Octave of Mi; the Moon vibrates Re so its activity is cut off from ours. An interesting link could be forged between the Re of the Moon and the Gregorian chant used at Chartres Cathedral which starts on Re, according to Charpentier. The Cathedral is dedicated to the Virgin; the female is the passive, moon principle. One tower of the Cathedral is said to be representative of the Moon, the other of the Sun; and Sun and Moon are active and passive or receptive, principles. The function of the Moon is perhaps hidden from us, as is concealed the feminine wisdom and intuition. It is an intriguing idea that there could be life on the Moon that we are simply unable to perceive. However, Ouspensky holds that the Moon has no life, in that sense, so the probability must be remote. At the second "shock” in the octave, we are not told what happens. Perhaps this is where we encounter certain kinds of discarnate beings and our own psychic experiences? It is perhaps useless to speculate at this stage. The next researcher into levels must be T C Lethbridge who carried out many archaeological explorations under the aegis of Cambridge University and made 2 or 3 Arctic trips by ship, doing various research projects. His work is well documented. But his most intriguing activities were probably those he undertook after retirement when he returned to live in Devonshire (where his family came from). By one event or another, he became interested in the operation of that small - but, at that time, the 1950s, still much-maligned - instrument, the pendulum. What Lethbridge discovered was quite staggering. The pendulum, for those who do not know, has been used for centuries by country people for finding underground water-systems. Today it is used by prospectors for locating mineral deposits and, even, oil wells. Every dowser will evolve his own methods of using the pendulum or divining rods of one sort or another. What Lethbridge did was rather different. He began by using it to find lost objects - say, something hidden in a cupboard or in an outhouse whose location had been forgotten. Further experiment showed that it could detect many things, both tangible or intangible, answer questions that required a straight Yes or No, and react to concepts visualised in the dowser's mind. It is obviously this last particularity that the sceptics and its detractors did not want to acknowledge. 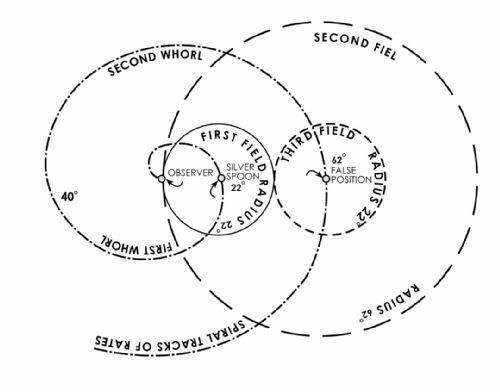 Lethbridge's experiments are described in several books and they led him to discover what he called his "compass rose of rates” which he later found to be a "spiral of rates” in that sense (see Fig.6 Ch3). When he thought about or visualised something, if it was material, he held a similar sample in his one hand and the pendulum, suspended on the appropriate length of thread in the other and swung it gently. At a certain length of the thread, it would either oscillate or go into a gyration. This process became more certain if he used his pointing-finger and outstretched arm in the direction in which he was looking for the object sought. In such a way, if he visualised "iron” and swept his pointing-finger across a front, at the point where it crossed a path to the place where an "iron” object was, say, buried in the ground, the pendulum would gyrate. Sometimes he would use two or three positions round a circle as "markers” for easier verification. If he dug at the spot, he would find, say, a nail or a forgotten mole-trap. Similar results could be obtained indoors over a map. This is something that is done by many dowsers and cannot be disputed. The length of the thread at which the pendulum reacted became the "rate” for the object sought - say, 29 inches for gold, 20 inches for white, 32 for iron, 14 for oak, etc. Any concept in no wise "physical” - emotions, mental abstractions, qualities, anything for which language has a description - could produce a rate on the pendulum compass rose. There are rates for anger, joy, old age, youth, heat, cold, east, west, green, blue, sleep, spring, evolution, etc. There is no limit to what can be detected with the pendulum. Every living thing, animal, vegetable and mineral has a pendulum rate. Nothing has been left out. Lethbridge, being a cautious and careful researcher, never jumped to conclusions. He had several co-researchers who, he reported, got the same results as he did. Nevertheless, for reasons as yet not understood, for a few people, the pendulum behaved differently. This is another stumbling-block for scientists who like to have everything repeatable, in all circumstances, and seem to feel uneasy in front of any aberration. To other researchers, however, such discrepancies are a stimulus to further endeavour and Lethbridge was of this view. But he never made claims and only reported what he found. If he was not satisfied with what he had discovered, he did not try to explain it. Besides gyrations, the pendulum would oscillate. This oscillation indicated an opposite answer to the gyration but, sometimes, it was not clear what was intended. He speculated a long time as to what could be going on and wondered if some "ray” could be involved. He came close to the idea of harmonics in his book “A Step in The Dark” which describes this phase of his work. He remembered that the Greeks had said the universe was made up of music or harmonics. I cannot help feeling that, if he had known of Kayser, who died 10 years before he did, Lethbridge could have clarified a lot of obscurities that he otherwise was unable to explain. Harmonics do seem to offer a very strong possibility for accounting the operations of the pendulum, on the basis of harmony or discord between vibrations emitted between the seeker and the object sought. The reactive agent between two vibrations is the pendulum. No complicated "rays” are needed. On the principle of harmonic resonance, 2 rates the same will cause the pendulum to gyrate since, being the same, they meet and inhabit or stop one another. Energy cannot pass. In the same way, two discordant vibrations will have the same effect, but two rates which are in harmony, say value of C - G, in harmonic accord, the pendulum will oscillate happily between them because it is not inhibited, and they enhance one another. On such a basis, a whole pendulum harmonical explanation can be built up and the rates seen as notes and the reactions seen as agreement (harmony) or disagreement between intervals. It is intriguing that the rate for male is 24 inches and that for female it is 29 inches; gold is 29 inches and diamond 24. Lethbridge proposed a neat theory about these 2 rates for the pendulum, apparently, oscillates smoothly between them. Male and female belong together. Perhaps 24 and 29 are two notes, say C and E, and they form a chord, each enhancing the other and both happy. And if, to carry the analogy a little further, it is the right combination, on another level, if they oscillate together, then it will be the "right” male and female combination and, if they don't, it will be best to end the relationship. (Perhaps the pendulum could be a good guide in choosing a marriage partner!) Lethbridge had even more to say about the hardness of diamond and pliable feminine character of gold. His conclusions, too long to quote, are in complete accord with cosmology. The compass zone is divided into 4 quarters at 10, 20, 30 and 40 inches. And these "four quarters” remind us of the four directions of China, the four elements of the Hindus and the quarternary of Greece and Europe. Of course, Lethbridge found only comparatively few rates and many more wait to be discovered. But, already, a format is emerging, a basis of some much more elaborate scheme of classification, as he himself believed. And a compelling comparison is found in Danielou's work, in the Chinese Trigrams and fixed tables of notes for everything to which it is possible to give a name. The Chinese tables strikingly resemble the Pendulum compass-rose. That a retired English archaeologist should have discovered such a comprehensive scheme - in a Devonshire garden in the 1960s, with a pendulum - is truly astonishing! In Nature, without Dung there can be no life, no evolution. This is astonishing, by any standards, and will appear more so today, in our chemically-drenched environment. A number of other probable cross-references are given, but their correspondences have not yet appeared. They await workers in the field. But we find indeed that, in the periodic table, Oxygen at 8 and Sulphur at 16 are in an octave relationship while, not opposite Carbon 12 on the compass-rose but at the quarter, we get Sodium 22, calcium and lead while, at 22.5, we get magnesium. Correspondences are opposites, which create stops and balances. Affinities are harmonies which produce chords which enhance the parties involved. Correspondences cancel each other out. Nature needs to stabilise herself in all her operations so that nothing dies out and nothing gets out of control. The regulation mechanisms of the biosphere appear to be built in. There is a great deal going on of which we are, as yet, ignorant and unaware. But here, at least, we do have the "bones” of some plan. We need to find out a lot more. There is something intriguing about the idea that male and female rates might be notes in a chord that resonate in tune together. And all kinds of similar combinations might be found in Nature. The theory of Companion Plants, a basic concept of Anthroposophy, where the right plants growing in company will help each other to grow and inhibit predators, could be explained on this musical hypothesis. For, if the pendulum rates are notes, then the compasrose is a spiral and on the same vibratory principle as the Chinese spiral of fifths. Within this spiral octave, notes will group themselves in chords which will vibrate happily together; whilst those that meet discordantly, because of wrong ratios, will not do so. In the case of the dowser, the mediator is his brain and the tool he uses is a pendulum. The principle of resonance must help to round out this argument. Every object emits its own frequency, on both physical and pre-physical levels, between atoms and molecules which affect each other as physical sensations and, also, on the higher consciousness octave where "signals” are passed, relating to concepts of the things signalled. Resonance links the several octaves and we get the physical results. I believe that harmonics offers a complete and satisfactory explanation of much that is called extra-sensory and which we otherwise cannot explain. Again, we can turn to Danielou to confirm the Hindu view. On p.143 of “The Introduction”, he says: "... the different aspects of the perceptible world are parallel manifestations starting from undifferentiated common principles ... There are ... natural and irresistible correspondences between different aspects of manifestation and one can easily, starting from one particular aspect, reach or evoke corresponding stages in other aspects. According to this principle, notes and chords must have exact equivalents in music with other aspects and in every category of existence.” He continues: "Only the knowledge of such correspondences can allow us to understand the real meaning of sounds or use them rationally as a means of evocation.” Notice the use of the word "evoke” - to call up, to visualise, to relate - or to resonate together? On this basis, every thought-form and every concept has its physical counterpart or presence and everything has its balancing correspondence. The equilibrium of forces must be maintained. Otherwise, if equilibrium is lost - and, since any momentum always tends to spiral outwards, like a tornado, unless it is restrained - it will soon become a spinning vortex and eventually explode. This is what the tornado does, leaving a trail of havoc in its wake, until it eventually dissipates and dies out. And this is the reason, built-in in Nature, why we find, in the atom, degrees of left- and right-hand spin, as we have already said. The earth is a spinning ball in a spinning galaxy, pursuing a spiral path across the heavens. Every so-many thousand years, it comes back - almost, but not quite, to the same place. Nothing ever exactly repeats itself, except by a relatively-near miss. Even in space, it is reported that galaxies spin in one direction or another. It is a balance of sorts. The only thing we do not know is how it is done. The pendulum rates must be notes in that particular octave. Thought-forms are in their own octave and all the different levels are in their own octaves. All the physical forms we see are bundles of energy quanta within the Light Spectrum vibrating - in ways that look like plants, people, bees, cows, hummingbirds, crocodiles, pampas-grass, rushing water, rocks, glaciers, seaweed, waves, butterflies, cowslips, oaks, palm-trees, dolphins, crabs, the leaves that appear in the spring, the flowers that bloom and the fruits that set seeds. Similarly, the images in our minds that we carry of things seen are reciprocal octaves at faster-resonating frequencies and shorter that we can thus accommodate in our "mind's eye". We see the same form inwardly as we saw outside. The archetype is the mental form of an idea in the mind of which the physical form created is a copy, as any artist can testify. Yet both have a real and separate identity. T. C. Lethbridge found that his compass-rose was also a spiral and, if he laid all his rates, by string-length out in a circle, he got a perfect Archimedean spiral whose angle of slope could easily be calculated. This gives added weight to the spiral nature of the octave. The rates are intervals within that octave and it should be possible to find them by virtue of their position round the circle. Lethbridge found 2 or possibly 3 more "whorls” of his spiral of rates, each with 40 inches added to the length of the string. So, what came at 17 inches on the first whorl was found at 57 on the next and 97 on the third, or 3, 43 and 83, or 16, 56 and 96 etc everything was repeated in the same place, one whorl further on. He then found that the second whorl did not come exactly above the first but to one side of it, in a complicated relationship plotted in. This is reminiscent of certain contentions made by people who have had "out of the body” experiences. Often in cases of severe illness, they have found themselves hovering above their bodies which are lying on the bed, while they, themselves, seem to be above - but to one side. On the principle of our harmonic spiral interval organisation between octaves, in the cycle of fifths, where one level is "cut off” from the one below; and, of the refraction of reflection of an object inserted into water which appears to be bent beyond the point of insertion, there should be no problem in interpreting these pendulum findings. Lethbridge found some strange anomalies on the three whorls, concerning time, and he puzzled as to what they could mean. On the first spiral, we get no rate for Time at all. But, on the second one, it comes in at 60, i.e. 40 + 20, the spoke that gives South, Earth, Heat, Life, etc. On the third whorl, he could not find it either. Lethbridge suggests that, on the first whorl, it does not exist because, in our physically restricted state, we are not aware of it (although we think we are!) We cannot "catch it” because it seems always to be running away from us - and, therefore, it offers no resistance to the pendulum. It is perhaps because, in the physical range, we are involved in an ongoing development. On the second whorl, we can contact it because it is not moving away from us so it offers resistance like anything else. We do not know what Time concepts will be on the next level. On the third whorl, he again could not find it, but he did not speculate on what that could mean. He just reported what he found and never claimed infallibility. Lethbridge made many odd discoveries which still await scientific explanation. But it must now be impossible to dismiss the pendulum rates and their correspondence with so many old established beliefs. There must be a common denominator. The Chinese system suggests strongly that all correspondences and visualisations in the mind are pre-existent, universal concepts with permanent frequencies or "notes” of their own which are constant. Lethbridge has confirmed completely such logical arrangements of the rates in many cases. Families of species have both their family and personal rates and, in nature, those organisms whose life-styles impinge on others and are dependent on other species also have the same rates. Thus, truffles have one rate, and the beech trees beneath which the truffles grow have, besides a rate for beech, a rate for truffles too. And the truffle-beetle that lives off the fungus has the same rate as the beech tree. This fact has implications far and wide (as will be discussed in a later Chapter). We do not know why the pendulum spiral is a circle of string-lengths to 40 inches. The inch, according to John Michell and Professor Thom, can be shown to be a "cosmic” measure, against the cubit or the Egyptian remen. And the number 40 is found in the Bible in a number of connections. There were 40 days in the Wilderness and we have 40 days in Lent. But, whatever the 40 inches signify, the spiral rises as an Archimedean one, at an angle of 1.5.